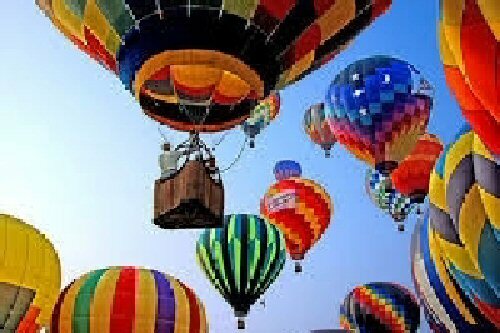 SANDY CREEK, NY – Hot air balloons will take to the skies over the Sandy Creek Fairgrounds and there will be plenty of action on solid ground with music, a petting zoo, crafts and vendors June 6, 7 and 8 at the Oswego County Balloon Festival. The event opens at 3 p.m. June 6, and closes with music by Frostbit Blue June 8. At least 10 hot balloons in a variety of styles are scheduled to fly, with balloon launches Friday evening, Saturday and Sunday morning, and Saturday and Sunday nights, weather permitting. After the sun sets Saturday evening, spectators will be treated to the sight of glimmering hot air balloons in flight during the “balloon glow” from 9 to 10 p.m. The event is being organized by All Over Events of Pulaski. Stevens has arranged for a full line-up of music from start to finish. In addition to Frostbit Blue, the weekend entertainment includes the Jason Wicks Band, F5, Kevin Barringer and Rich Richmond and the Whitetail Band, Fulton Chain Gang, TJ Sacco and the Urban Cowboys, Country Swagg and Emalee Herrington. One dollar of every admission ticket will benefit Music for the Mission of Syracuse. Balloon rides will be available through balloon pilots Scott and Peter Griswold of Above All Balloon Rides of Syracuse. The Griswold family co-founded the Jamesville Balloon Festival many years ago. To book a ride in advance, call Peter Griswold at 315-263-0385. Other activities include a wine tasting tent, kids’ zone, food vendors, crafts, a bounce house and riding bull. Admission is $10 at the gate and $8 advance sale. There is no admission charge for children age 10 and under. Onsite parking is included in the admission price. The Oswego County Balloon Festival is sponsored by Tunes 92, Port City Blue Print, Zink Shirts, Wolf Radio and All Over Events. The Sandy Creek Fairgrounds is located on Ellisburg Street in the town of Sandy Creek, just off I-81, exit 37.